Have you ever wondered what it's like to have more make-up brushes than you know what to do with? 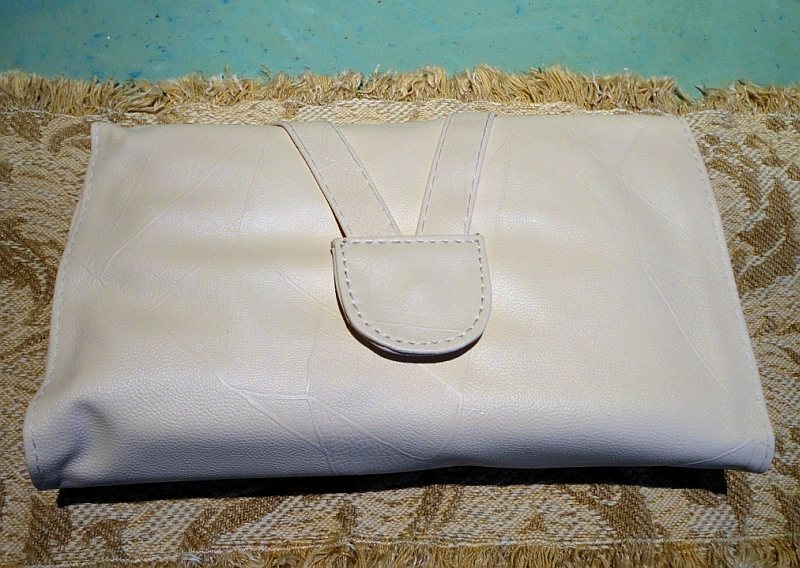 That's I felt when I first opened this gorgeous cream clutch, and unfurled it to its full extent. Pictures do not do it justice because the whole thing is not just impressive but also quite beautiful. The packaging is a transparent bag with a plastic zip closure. Inside are the brush holding bag and also a powder puff and two mascara wands. 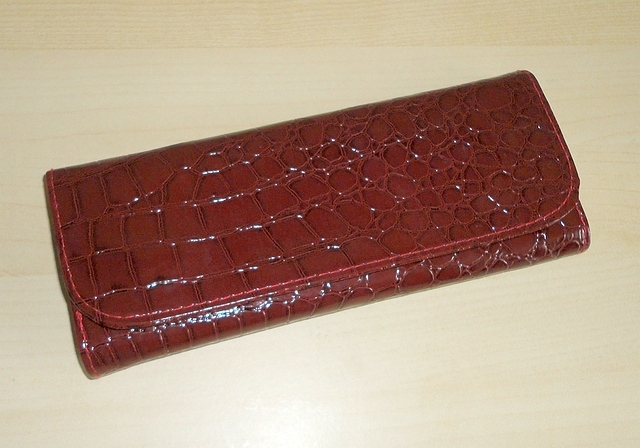 When closed, the clutch looks like a fashion accessory made of practical faux-leather with a magnetic stud closure, very easy to pull open and fasten again. Inside the brushes (each enclosed in its clear plastic sleeve) are arranged in individual pockets and a protective flap covers the tops to keep them flat and organised. The twenty-four applicators are mostly brushes but there are also a pointed foam tip, a double-sided eyebrow comb/brush, and a mascara wand. Fourteen are small, ideal for precise application of eye make-up (or perhaps lipstick) and all slightly different in shape and slant. I love having so many similarly-sized brushes to load with different shades without having to wash them every time. The larger applicators are great for powder and liquid products, but not so good for compacts, as the bristles are really extremely soft and don't pick up pressed powders easily. They are described as being horse hair and synthetic, so perhaps a mix. The brushes have wooden handles, painted a gorgeous mauve/silver with gold-tone ferrules. The bristles are cream with dark tips and the look is decidedly elegant. This set is the most comprehensive I've yet reviewed and should provide all you need to apply make-up to your face, at home or on the go. As usual, the first thing I did on arrival was to take out all the brushes and wash them with my vanilla-scented shower gel. Any synthetic smell disappears and I am also able to evaluate the basic quality. These brushes passed the first test as I did not notice any shedding, they washed well and dried quickly without losing their shape. I then used them daily for a couple of weeks. I really love the softness and the way the handles feel in my hand. It's pointless to go through each brush's purpose as there are no set rules and everyone will have their favourite way of using them, but for my purposes, everything I need is there except, perhaps, for a slightly stiffer round type for compact powder. The large fan-shaped ones are useful for brushing particles away after applying mascara or eye shadow, and for blending brightening powders or bronzers in a subtle way. Also suitable for neck and décolleté. As for durability, so far the painted finish is holding up well with no visible flaking and I haven't noticed any hairs coming off. These brushes are a pleasure to use and make my everyday products easier and faster to apply. The handles give a great feel and make it easy to be precise. I would not normally carry so many brushes around with me but, because the bag is such a neat shape and size, it's easy to slip it in my hold-all, giving me access to a full selection of applicators without having to rely on what comes with the product. The powder puff is a nice little bonus. I go through lots of those as they usually don't wash well. The price is very competitive and fully justified, in my opinion. These gorgeous brushes would make a beautiful gift, or just treat yourself. A sample item was provided to me for my impartial review. This is a delightful collection of professional-quality make-up brushes, beautifully packaged and luxuriously presented in a gorgeous box that would make a perfect gift. I can't imagine a make-up wearing woman who would not be delighted to receive this, whether she had bought it herself or been gifted it. The visual impact is considerable. The box is a deep purple-blue with a sprinkling of golden “stars” and elegantly set off by a printed white bow. It arrived protected by a white sleeve. Due to its generous size, the brushes sit in a single layer with no danger of being crushed. Pulling a loop of golden ribbon makes the inner box slide out like a drawer. Inside are six assorted brushes, individually protected by clear plastic sleeves, a comprehensive booklet (in English, German, French and Japanese) describing their purpose and a pretty gift card. The set I was sent for evaluation has the golden handles which look really plush, but the metallic lilac finish looks equally smart in the photos. So far, the painted finish is holding up well, with no visible flaking. There are two different foundation and face powder brushes, a rounded one for blush/bronzer, a stiffer angled one for contouring, a tapered one for eye contour and crease shaping (which at first I thought too big but turned out just perfect for blending) and a smaller one for more precise eye powder application. I could have used one more small brush for a different shade of eye shadow, but I see that USpicy now offer a 10-brush assortment for only a little more money. The bristles are incredibly soft and silky and in normal use I didn't notice any shedding. A weekly wash with baby shampoo seems to keep them in peak condition, especially important if you use both liquid and powdered make-up products. It is also recommended before your first use to remove the slight chemical odour. Since receiving these lovely brushes, I have thrown out a lot of my old ones, as well as some sponges, as they didn't come close to the quality and performance of these USpicy brushes. At this ridiculously low price, they represent a great investment and are worth buying just for the time they save, to say nothing of the excellent results possible with your everyday products. Just one long-handled eye powder applicator cost me half the price of this set of six! I grew up in my parents' beauty salon, so I do have a bit of insider knowledge. 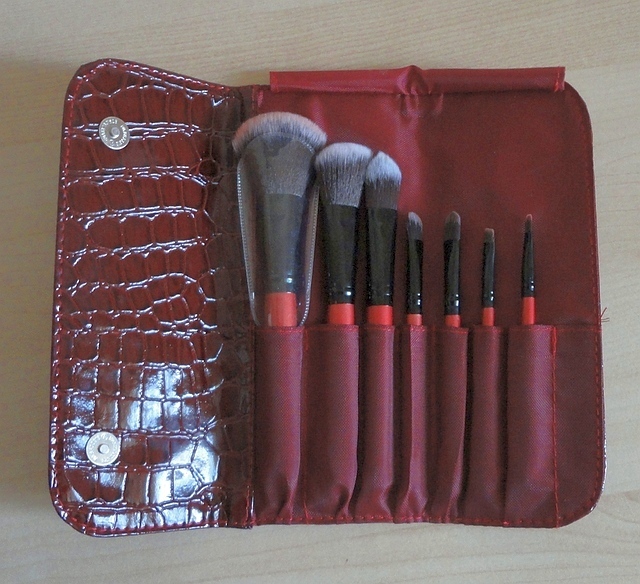 This is a gorgeous set of professional-quality make-up brushes, luxuriously housed in a lovely faux-crocodile skin clutch-shaped bag. It arrives simply packaged in clear plastic, but still makes a great first impression. The top flap is secured by two magnetic closures that are very easy to pull open and fasten again. Inside, seven brushes (each enclosed in its clear plastic sleeve) are arranged in individual fabric pockets and there is a protective fabric flap that folds down over the tops to keep the brushes flat and organised. I really like the burgundy colour, it's elegant and edgy. The selection provides all you need to apply basic make-up to your face, on the go or at home. 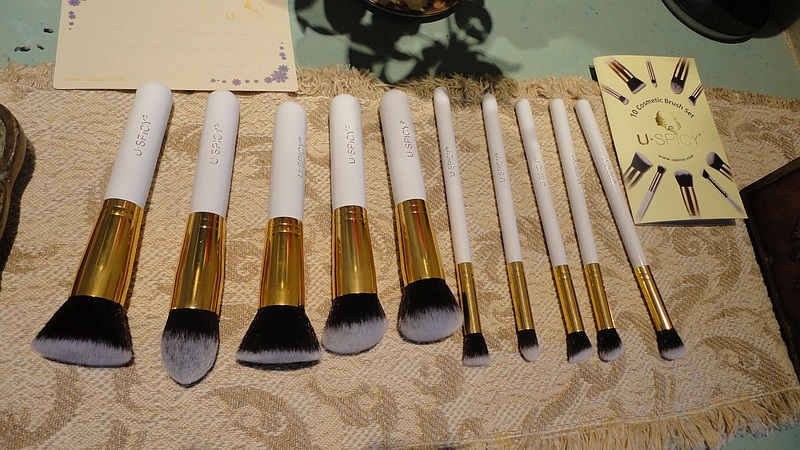 A cute touch: each brush is labelled in gold lettering, with a hint about suggested use. The brushes have wooden handles finished in burgundy paint, and are made of incredibly soft synthetic material. As usual, it is best to wash the brushes before your first use, which will remove any lingering chemical odour. Just work a drop of mild liquid soap into the bristles, rinse well under the tap and allow to dry away from heat, bristle side up, to keep the shape. A weekly wash will keep these lovely brushes in top condition. So far, after several weeks in daily use, the painted finish is holding up well with no visible flaking and I haven't noticed any hairs coming off. These brushes are a pleasure to use. The handles give a great feel and make it easy to be precise. The synthetic bristles are silky soft, they distribute powered products evenly and work well with creamy stuff, too, like under-eye concealer. Because the bag is such a neat shape and size, it's easy to slip it in your handbag or hold-all ensuring that you have a full selection of applicators without having to chase around for individual items or relying on the awful ones that are sometimes provided with the product. The big sponge is a nice little bonus. It works well to remove make-up with a soap-type remover and water and it's easy to wash and dry. The price is incredibly modest for such quality and I love the excellent results I've been getting with my everyday products. I once paid half the price of this set of seven for just one long-handled eye powder applicator! These gorgeous brushes would make a beautiful gift, or just treat yourself. 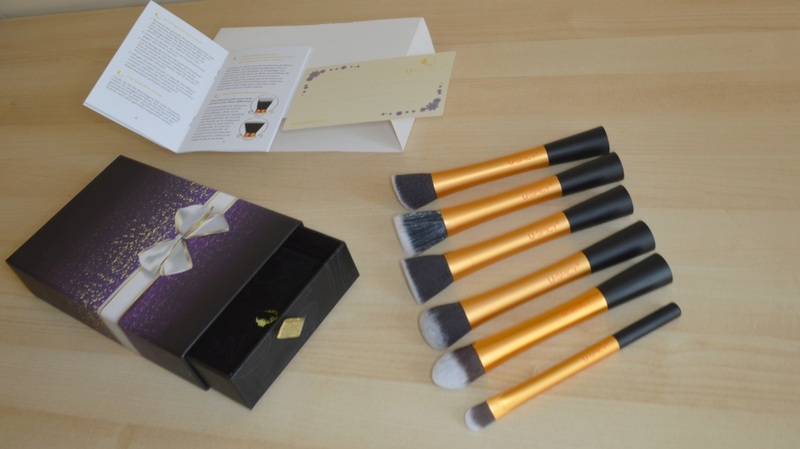 A gorgeous set of ten super-soft, professional-quality make-up brushes housed in such a pretty box that it feels like you are giving yourself a present. This set is also ideal to give as a gift and I can't think of anyone I know who would not be delighted to receive it. The box makes a great first impression: a lovely dark purplish-blue sprinkled with golden “stars” and encircled by a printed white bow, protected by a disposable white cardboard sleeve. The inner box slides out like a drawer by means of a loop of golden ribbon. Ten brushes of various sizes are ranged inside, each protected by a clear plastic sleeve. There is also a booklet (in English, German, French and Japanese) with detailed descriptions of the suggested use for each brush and a lovely blank gift card to personalize your gift. In my video I go through each brush's description but, for my purposes, as a devotee of the smoky eye look, all the five smaller applicators are suitable for eye shadow, crease definition, brow highlighter and under-eye concealer, while the five larger ones do a terrific job of applying and blending liquid foundation, loose powder, mineral brighteners, blush and bronzer products. You will soon find a favourite way to use each one. The brushes are light but solid and feel easy to hold for optimum control. They look superb with their wooden handles painted ivory-white, gold-tone ferrules and dark brown bristles with white tips. Do not be put off by the chemical odour. You should always wash brushes before your first use anyway, and once a week, if in regular daily use. One thing I would suggest is to follow the detailed advice in the booklet and wash and rinse the brushes under the tap. Don't leave them soaking because you risk damaging the handles and ferrules. With normal care, my brushes are holding up well, the painted handles looks like new and there is minimal or no shedding. The bristles are incredibly soft and silky and hold their shape well. I think the price is really attractive, considering the quality and scope of this collection. I also find that I'm saving time and getting much better results with my everyday cosmetics. My parents owned a beauty salon, so I do have a bit of insider knowledge.